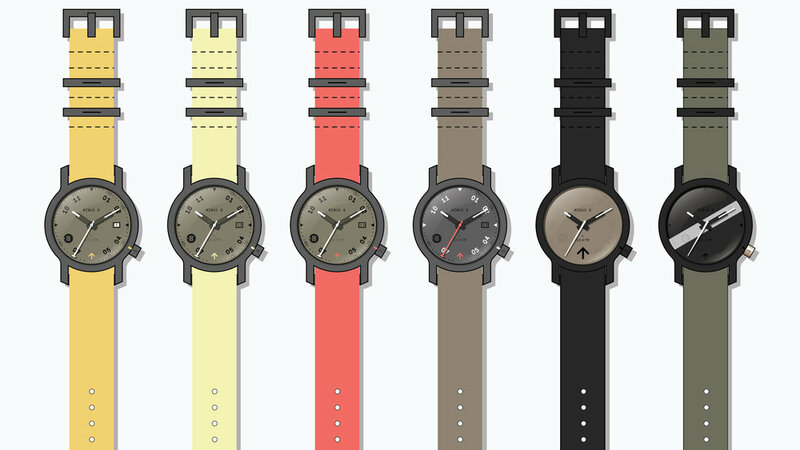 The Anza is a modern interpretation of the field watch for MINUS-8. It represents an updated positioning that is inspired by a machined aesthetic and the beautiful landscapes here in GMT-8. Design Spring 2017. Release Fall 2017. Design Direction and Design. David Whetstone, Astro Studios, San Francisco, CA. Lead Design. Sean Missal. Astro Studios, San Francisco, CA. NEW MINUS 8 BRAND INSPIRATION. Inspiration for the ‘new” MINUS 8 equally blends influences from a machined aesthetic and the beautiful landscapes and colors in GMT-8. For The Anza, the goal was to create a watch that was tough enough to be worn as an everyday piece and as an active tool, yet refined enough it could be worn as an accessory to elevate streetwear looks. The Anza continues MINUS 8's “machined aesthetic,” but evolves it to also be soft, rounded, and human rather than always crisp and architectural.